In Scotland, the first Monday of the year or the Monday after Jan. 12th was a day for: presents (handsels); a breakfast of "roast and boiled, with ale, whiskey, and cake" for the farm hands and servants; visiting neighbors; Moving Day and even a day for hiring new workers. It appears to be one of the courses or a small meal of roasted meat and a boiled one or more... served hot or cold. Sala gave details on American meals in 1861 saying “The soups first, then the fish, then the entremets, then the roast and boiled, and lastly the pastry and dessert…" Later Sala wrote of casual meals he enjoyed: "...let me take my modest cut of roast and boiled, my "one o' taters," my "cheese and sallary," at an eatinghouse in Bucklersbury." "Handsel Monday. The first Monday in the year. This is a great holiday among the peasantry and the children generally in Scotland, being especially devoted to the giving and receiving of presents, or, in the Scotch vocabulary, handsels. 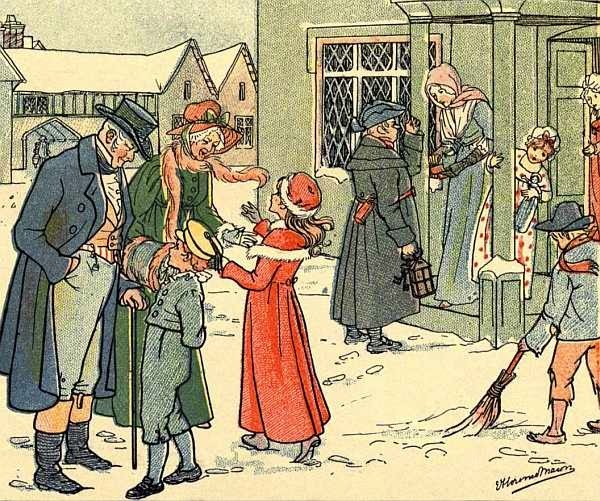 The young visit their seniors in expectation of some remembrance, and postmen, scavengers, and newspaper carriers look for the equivalent of what in England are known as Christmas boxes. In the remoter rural regions Auld Handsel Monday—i.e., Handsel Monday, Old Style, or the first Monday after the 12th of January—is the day usually held. On this occasion it was the ancient custom for farmers to treat all their servants to a liberal breakfast of roast and boiled, with ale, whiskey, and cake, after which the guests spent the day in visiting among their friends. It was also moving day in old Scotland, and the date when new engagements were entered into with servants and farm-hands."